The Hess Corporation (formerly Amerada Hess) is an American integrated oil company headquartered in New York City, and a Fortune 100 corporation. The company explores, produces, transports, and refines crude oil and natural gas. Vertically completing the logistical chain, about 1,360 Hess branded filling stations market gasoline to consumers in 16 states along the East Coast of the United States. Refined petroleum products, as well as natural gas and electricity, are marketed to customers throughout the East Coast of the United States. Although towered over in size by enormous global players in the same industry, Hess placed #75 in the 2013 Fortune 500 rankings. The company has exploration and production operations in the United States, United Kingdom, Norway, Denmark, Russia, Equatorial Guinea, Algeria, Libya, Gabon, Egypt, Ghana, the Joint Development Area of Malaysia and Thailand, Indonesia, Thailand, Azerbaijan, Australia, Brazil, and St. Lucia. Hess is also active in the financial markets, through the Hess Energy Trading Company (HETCO), its trading arm. Hess Corporation is a signatory participant of the Voluntary Principles on Security and Human Rights. In 1919 British oil entrepreneur Lord Cowdray formed Amerada Corporation to explore for oil in North America. The firm was incorporated Feb. 7, 1920, in Delaware as a holding company for its principal subsidiary, the Amerada Petroleum Corporation. The oil producer experienced growth during most of the 1920s, hitting a peak in 1926 with a net income of US$4.9 million. However, in the years leading to the Great Depression, weakness in the oil markets contributed to sluggish profits. The aftermath of the market crash aggravated the unsteady oil industry. In the first quarter of 1930, the company experienced a minor loss. The early years of the Depression was a struggle against wavering demand and overproduction in some regions. Later into the 1930s, the financial forecast became more sanguine for Amerada. In December 1941, the company reorganized by merging the holding company with the principal operating subsidiary, Amerada Petroleum Corporation, into a simplified operating company. The new entity also adopted the former subsidiary's name. Robust postwar growth rocketed the company past US$100 million in sales in 1955. Hess Oil and Chemical, an oil refiner and marketer founded by Leon Hess, acquired 10% of the company for US$100 million in 1966 after the British government sold a stake it had amassed during World War II. Albert Levinson became the senior vice president and designed the Hess logo. Hess and Amerada would announce plans for a merger in December 1968. Some Amerada stockholders led by Morton Adler criticized the arrangement as being too favorable for Hess. Adler argued Amerada's oil reserves would contribute the lion's share of assets for the proposed company, so Amerada stockholders should retain more control of the new company. Before the stockholder vote on the matter, Phillips Petroleum, an integrated oil firm, approached Amerada with its own merger proposal, but the offer was declined in March. Still interested, Phillips nonetheless stated it would not carry out a proxy fight against the proposed Hess deal. Hess fearing such a strategy, made a cash tender offer of US$140 million for an additional 1.1 million shares of Amerada, which would double its holding in the company. The new shares would be employed in a May stockholder vote deciding the merger's fate. The vote took place amidst shareholder rancor that in addition to echoing Adler's arguments, objected to Amerada's financing of the recently completed tender offer. Hess planned to cancel the shares and the cost of the acquisition would be absorbed by the newly formed company. One shareholder at the meeting quipped, "It looks to me as if Hess is buying Amerada with Amerada's money." Proponents of the deal won, and the US$2.4 billion merger combining a purely production company with a refinery and marketer operation was completed. However controversy was not yet extinguished by the stockholder confirmation. A class action federal lawsuit in 1972 claiming the proxy vote information was misleading. In 1976, a court agreed that the company falsely claimed to have considered each company's assets as a reason for the merger. In 2001, Amerada Hess purchased Triton Energy Limited in a cash tender deal valued at approximately US$3.2 billion. Triton, one of the largest independent oil and natural gas exploration and production companies in the U.S., had earned a reputation as a maverick oil company due to its highly successful yet potentially risky overseas exploration. According to Amerada Hess press releases at the time, Triton's major oil and gas assets in West Africa, Latin America, and Southeast Asia would strengthen its exploration and production business and give it access to long life international reserves. Hess also stated that the purchase was expected to immediately increase the company's per-day barrel output by more than 25 percent. Following on the heels of the Triton purchase, energy prices fell and global economies weakened. Amerada Hess struggled through the following years, posting a US$218 million loss in 2002 due primarily to a US$530 million charge relating to its write-down of the Ceiba oil field, but then posting steadily increasing profits from 2003 through 2006, when the company posted US$1.920 billion in net income. In May 2006, Amerada Hess Corp. changed its name to Hess Corp.
On March 4, 2013 Hess announced that it would sell its domestic refineries and retail operations and that it would also sell its holdings in Indonesia and Thailand. The New York Times also reported that Hess retail and refinery operations contributed about 4 percent of the company's revenue. It also noted that Hess will sell its holdings in Indonesia and Thailand. The company will focus exclusively on oil production, following a recent trend in the oil industry for companies to spin off their downstream assets and focus on their more profitable upstream business; ConocoPhillips and Marathon Oil have also made similar spinoffs in recent years with Phillips 66 and Marathon Petroleum, respectively. In April 2013, Hess Corp announced it would be selling its Russian unit to Lukoil for $2.05 billion. In July 2013, Hess Corp said it would sell its energy marketing unit to UK firm Centrica for around $1.03 billion. Hess Corp announced in October 2013 that it was planning on selling its East Coast and St.Lucia storage terminal network to Buckeye Partners LP for $850 million. Hess Corp announced in December 2013 that it is selling it's Indonesian assets to an Indonesian petroleum consortium. 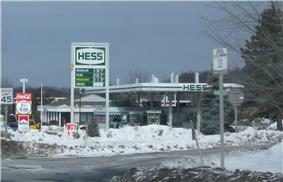 On January 8, 2014 Hess filed for a tax-free spin-off of its gas station network. The newly formed company was to be known as Hess Retail and will include over 1,200 stores throughout the Eastern United States. Before completing the spin-off, Marathon Petroleum subsidiary Speedway LLC announced on May 22, 2014 that it would acquire the retail unit of Hess Corp for $2.87 billion. Upon the closure of the acquisition in late 2014, the company's gas stations will be rebranded under the Speedway banner by 2017. The transaction completed the transformation of Hess into an oil company focused solely on exploration and production, effectively reversing the Amerada merger almost 50 years prior. Hess Energy Trading Company (HETCO) is a full-service proprietary energy trading company and market maker established in 1997. It was founded by two Goldman Sachs partners responsible for the energy trading business at the investment bank. HETCO offers its clients and partners extensive access to the global physical and financial energy markets. HETCO is partly owned by, and fully guaranteed by Hess Corporation, a Fortune 100 company. HETCO is an advisor and risk management counterparty of some of the largest energy enterprises in the world. As a major player in all energy markets (cash, futures and options, physical and cash-settled), HETCO is responsible for a significant market share of the Electricity, Natural Gas, Weather, Crude Oil, Refined products and energy equity derivatives. Hess has gross exposure to oil derivatives equivalent to 1.7bn barrels – about three months’ US consumption – from trading “conducted principally” through HETCO, filings show. HETCO’s offices are in New York, Boston, Houston, London, Dubai, Singapore and Geneva. HETCO’s trading team has worked at major oil firms and leading financial institutions, many of whom have been trading since energy markets were commoditized in the mid-1980s. HETCO also offers specialist energy advisory services to public, private, state-owned companies, sovereign entities and financial institutions through its subsidiary HETCO Advisory Services (UK) Ltd. One of HETCO’s coups came in 2004 when the company signed a contract to help Sonatrach, the Algerian oil and gas company, hedge price risks and expand its customer list to the US and the Asia-Pacific regions. Hess announced March 4, 2013 that it plans to exit the energy trading business along with retail and energy marketing. The New York Times reported on October 28, 1990, that a barge, with a load of 31,000 barrels (4,900 m3) of kerosene, struck a reef in the Hudson River spilling 163,000 US gallons (620 m3) of fuel. Immediately, Hess assumed responsibility for the cleanup; the Coast Guard worked alongside the Red Star company to clean and to contain the spill to one area. Coast Guard official Mr. Holmes said "The weather and wind conditions are almost as close to perfect as they could get," and this contributed to a quicker and surer cleanup than could otherwise be. According to The New York Times, Mr. Holmes also said that 70 percent of the spill would be gone in three days due to the natural evaporation rate of kerosene. Even though most kerosene evaporates, toxic chemicals such as benzene stay in the water and harm certain fish. Hess claims that their corporate policy has "long stressed" their "fundamental commitment to comply with applicable environment, health and safety laws and regulations," and they claim to clean every spill made. The Patchogue Oil Company, brought under the Amerada Hess Company in 1977, was responsible for an oil spill in the Gowanus Canal on January 3, 1976, when more than 2.5 million US gallons (9,500 m3) of number 6 crude oil was spilled into the Gowanus Canal. At that time, this was the largest oil spill on record. In accordance with a New York State Department of Environmental Conservation (DEC) agreement the Hess Corporation will pay $1.1 million in fines and also "bring 65 gasoline stations and oil storage facilities into compliance with state requirements." The agreement addresses more than 100 violations at 65 gas stations and Hess's Brooklyn major oil storage facility. The agreement is aimed at resolving Hess's violations in the DEC's New York City and lower Hudson Valley regions. In a recent water contamination case against several major US oil companies, the Hess Corporation will pay part of a $422 million settlement. The case was filed by 153 public water providers in 17 states against the oil companies "over drinking water contamination caused by the gasoline additive Methyl Tertiary Butyl Ether (MTBE)." The settlement also stipulates that the settling parties pay their share of treatment costs of the plaintiff's wells that may become contaminated or require treatment for the next 30 years. In regard to greenhouse gas emissions Hess outlined in their 2006 Corporate Sustainability Report a "four element" strategy to reduce and control emissions. The strategy's steps include monitoring, measuring, managing, and mitigating. Through reporting results, energy efficiency and recovery, and carbon capture and trading the company intends to improve its environmental impact. The Hess toy trucks, helicopters, police cars, airplanes, space shuttles and rescue vehicles have been popular Christmas gift traditions for nearly 50 years  in the US. It is one of the longest running toy brands on the US market. Since 1964, Hess gas stations have sold toy trucks each year around Christmas time. Each year, the model changes to a new design. Older models are considered collectibles and typically sell for a few hundred or even thousands of dollars. For example, the 1964 truck sells for about $1,400-2,000, depending on condition. Hess periodically has a rare truck such as the 1995 chrome truck with helicopter and the 2002 chrome Mini, which were given away at a stockholder meeting and, more recently, the 2006 truck given to New York Stock Exchange employees to commemorate its name change from Amerada Hess Corporation to Hess Corporation. In Christmas of 2011, The Hess Corporation donated 900 of its 2011 Hess Toy Trucks and Race Cars to the Salvation Army for the underprivileged children in North Dakota. There is a Hess Toy Truck Float in the annual Macy’s Thanksgiving Day Parade in New York. The toy truck business will continue after the sale of Hess' retail unit to Marathon. ^ Standard and Poor's 500 Guide. McGraw-Hill. 2007. ^ Hoover's Handbook of American Business 2008, Volume 1. Hoover's. 2007. pp. 422–424. ^ Benedict, Roger W. (May 16, 1969). "Merger of Amerada Petroleum, Hess Oil, Valued at $2.4 Billion, Voted by Holders". The Wall Street Journal, pg 4. ^ "Court Rules Amerada's Holders Were Misled In Merger With Hess" (August 2, 1976). The Wall Street Journal, p. 4. ^ Mote, Dave. "Triton Energy Corporation". Answers.com. Retrieved 2010-12-28. ^ "Amerada Hess To Acquire Triton Energy For $45 Per Share In Cash" (Press release). Amerada Hess. 2001-07-10. Retrieved 2010-12-28. ^ "Hess Corporation: Investor Relations Annual Reports". Phx.corporate-ir.net. Retrieved 2010-12-28. ^ De La Merced, Michael J. New York Times. "Hess to Sell Gas Stations as Part of a Shift in Strategy." March 4, 2013. Retrieved March 6, 2013. ^ Michael Erman and Vladimir Soldatkin (1 April 2013). "Hess Corp to sell Russian unit to Lukoil for $2.05 billion". Reuters. ^ Swetha Gopinath and Sarah Young (30 July 2013). "Hess to sell Energy Marketing unit to UK's Centrica for $1.03 billion". Reuters. ^ Michael Erman and Matthew Robinson (9 October 2013). "Hess to sell storage terminal network to Buckeye for $850 million". Reuters. ^ "Hess Corp selling Indonesia assets for 13 billion". Motley Fool. 2 December 2013. ^ "Hess Files for Tax-Free Spin-off of Gas-Station Network". Bloomberg. 2014-01-08. Retrieved 2014-05-01. ^ "Hess stations to fly 'Speedway' banner after sale to Marathon Petroleum for $2.87 billion". Associated Press. 22 May 2014. ^ "Hess Announces Sale of Retail Business to Marathon Petroleum Corporation for $2.6 Billion". Hess Corp. Retrieved 24 May 2014. ^ Yes on Proposition 89 (2006-09-22). "Big Oil Throws Down Against Proposition 89". Proposition89.blogspot.com. Retrieved 2010-12-28. ^ NYSDEC - New York State Department of Environmental Conservation (2008-03-04). "Hess fined $1.1m for Hudson River estuary pollution". Environmental-Expert. Retrieved 2010-12-28. ^ "Dallas law firm Baron & Budd wins $422 million water contamination lawsuit". Pegasus News. 2008-05-11. Retrieved 2010-12-28. ^ "Hess Toy Truck". 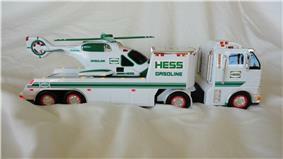 Hess Toy Truck. Retrieved 2011-02-07.